Andy Friend with Peter Wilkins and Jimmy Duffy last month. CONNACHT TODAY CONFIRMED that Andy Friend’s backroom team have signed two-year extensions to their existing deals and will remain at the Sportsground until 2021. Friend, who arrived on a three-year deal ahead of this season, has overseen an impressive resurgence in the western province. The Australian has continually attributed much of that success to his coaching team and the reward has come for attack coach Nigel Carolan, forwards coach Jimmy Duffy and defence coach Peter Wilkins. Head coach Friend, whose charges sit just five points behind Glasgow Warriors in Pro14 Conference A, said that securing his backroom team on fresh deals had been a priority. “They are an exceptional team and one of the best collective groups I have worked with in my coaching career. Email “Connacht coaching ticket extend contracts to remain at Sportsground until 2021”. 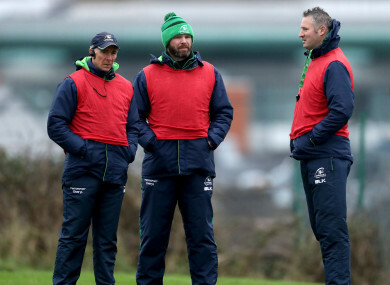 Feedback on “Connacht coaching ticket extend contracts to remain at Sportsground until 2021”.